Follow these tips from Zero Waste Marin to reduce waste during the holidays! Check your pantry before you go shopping, then make a list and buy only what you need for each recipe, especially if you are cooking for a large group. For more ways to streamline your shopping trips, visit our Tips to Reduce Waste at Home page. Make the most of Thanksgiving by transforming leftovers into satisfying soups, sandwiches, pot pies and more. A simple online search will yield a wide variety of yummy recipes. If you cooked or purchased too much, consider donating to local organizations such as the San Francisco-Marin Food Bank, the Ritter Center or St. Vincent De Paul Society. For more tips, visit our Food Waste Prevention page. Help keep food waste out of the landfill! Simply toss your turkey carcass, stems, peels, bones and any spoiled food scraps into your green compost cart. For more information on how to compost visit our Composting Info and Courses page. Deep frying your turkey this year? Remember that leftover fats, oils and grease should neverbe poured down the drain. Marin County residents, except those in Novato, can bring used cooking oil in liquid form to the Marin Household Hazardous Waste Facility in San Rafael. 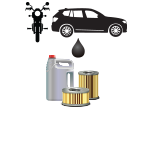 For more information on safe disposal, visit the Fats, Oils & Grease page. If you live in Novato, find more information on handling FOG here. Zero Waste Marin works with cities and towns throughout Marin County to educate residents about reducing the amount of waste that goes into our local landfills. Click HERE to download a PDF copy of this newsletter. These days, people depend on a variety of rechargeable and non-rechargeable batteries to get them through their everyday lives. This means that there is a higher-risk factor associated with the handling and disposal of batteries when they reach end of life. All batteries can and should be recycled, and consumers should take time to educate themselves on industry-recommended methods of being battery-safe. In Partnership with the Avoid the Spark. Be Battery Safety Smart campaign, Zero Waste Marin is promoting battery safety. This initiative shortens the gap between consumers and industry experts, providing educational resources. There are simple steps YOU can take to reduce the risks of battery recycling. Click the links below to learn more. The National Prescription Drug Take Back Day aims to provide a safe, convenient, and responsible means of disposing of prescription drugs, while also educating the general public about the potential for abuse of medications. See below for Marin County locations. 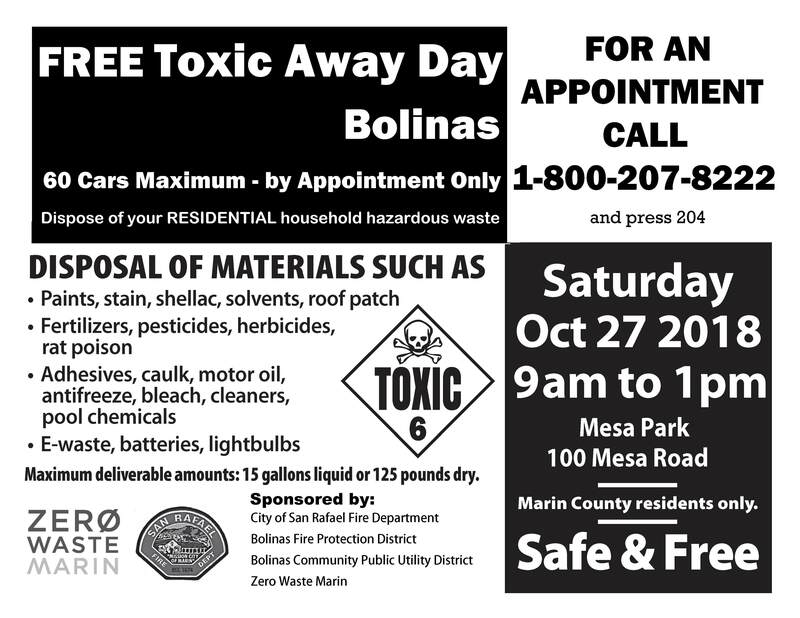 Zero Waste Marin, in coordination with San Rafael Fire and Marin County Fire have teamed up for another exciting Toxic Away Day in West Marin. In an effort to reduce hazardous waste incidents, and to facilitate safe situations for our firefighters, Toxic Away Days are designed to encourage residents not to stockpile their hazardous waste, but to dispose of it properly during these residential disposal events.